How is tobacco made? 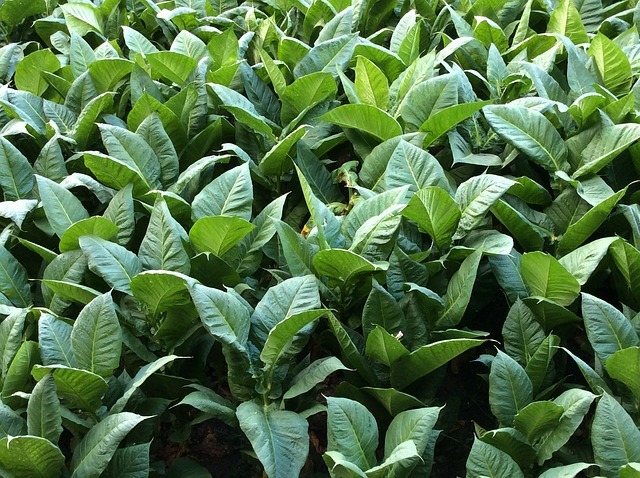 The simple answer is that tobacco is made by curing the leaves of the tobacco plant. The more detailed answer is that tobacco plants are first grown in a “setting box” where they are protected from frost. The more wet the weather, the lower the crop yield. Severely dry crop conditions produce a high yield. When the plants are full-grown and ready to be harvested, they are sent to a processing facility where they are de-stemmed and washed. Then the leaves are stored in “hogsheads” (huge tobacco barrels) for long-term aging. Aging tobacco allows the blends to “marry.” A premium cigar ages for two to three years. After it is rolled, it ages another three months or longer in an aging room before it is shipped. The longer a cigar ages, the more it mellows because the harsher, more acrid flavors will dissipate over time. Time also allows moisture to be more evenly distributed throughout the cigar, resulting in a more even burn. Some say a cigar should age until it reaches its pinnacle of flavor, although when cigars reach their pinnacle is highly subjective. For a wide selection of premium cigars and the largest walk-in humidor in Highlands County, visit BeBe’s Tobacco. BeBe’s Tobacco is known as “The Best in the Highlands” for tobacco products. BeBe’s Tobacco is located in Sebring and serves Sebring and the surrounding areas, including Avon Park, Lake Wales, Lake Placid, Desoto City, Desoto County, Spring Hills, Yeehaw Junction, Bartow, Cypress Gardens, Winter Haven, Haines City, Lakeland Highlands, Auburndale, Lakeland, Winston, Saint Cloud, Port Charlotte, Punta Gorda and Plant City.